US Vice President Mike Pence kicked off a trip to the Middle East on Saturday with a visit to Egypt, where he pledged firm US backing to President Abdel Fattah al-Sisi in the nation’s fight against militants. Pence said ties between the two countries had never been stronger after a period of “drifting apart” and that President Donald Trump sent his gratitude to Sisi for implementing economic reforms. “We stand shoulder to shoulder with you in Egypt in the fight against terrorism,” Pence said. Sisi said the two men discussed ways to eliminate the “disease and cancer” of terrorism and called Trump a friend. Pence’s quick visit comes at the start of a three-country tour that also includes stops in Jordan and Israel. This is the highest-level visit from a US official to the region since December, when Trump recognised Jerusalem as Israel’s capital. That decision, which reversed decades of US policy and set in motion the process of moving the US embassy to Jerusalem from Tel Aviv, upset leaders in the Arab world and prompted Palestinians to reject the United States as a broker for peace. Pence, a conservative Christian who was one of the driving forces behind the move, and Sisi did not discuss the Jerusalem decision during their public remarks in front of reporters. Egypt has faced security problems, including attacks by Daesh militants in the North Sinai region. Trump has made the fight against Daesh a top priority. Upon arriving at the palace where Pence and Sisi met, reporters traveling with the vice president initially were not allowed to exit their van and enter the building. Eventually they were admitted and allowed to attend part of the meeting. From Cairo, Pence heads to Jordan, where he will meet with King Abdullah, a close US ally. Abdullah warned against declaring Jerusalem as Israel’s capital, saying it would have a dangerous impact on regional stability and obstruct US efforts to resume peace talks. Many people in Jordan are descendants of Palestinian refugees whose families left after the creation of Israel in 1948. 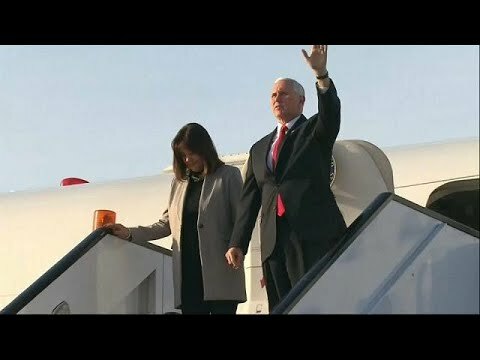 Pence, whose wife, Karen, is accompanying him, will end his trip in Israel, where he will be warmly welcomed in the aftermath of Trump’s decision. He plans to meet with Israeli Prime Minister Benjamin Netanyahu, address the Israeli legislature and visit the Western Wall. Pence is not scheduled to meet Palestinian leaders. They were incensed by Trump’s decision on Jerusalem, which upended the longstanding US position that negotiations between Israel and the Palestinians must determine the city’s status. The Trump administration’s recent announcement that it was withholding about half of the aid it was due to give to a United Nations relief agency that serves the Palestinians raised questions about fledgling US efforts to revive Israeli-Palestinian peace talks and further undermined Arabs’ faith that the United States can act as an impartial arbitrator. Pence also plans to visit with US troops while he is in the region.